Ask someone to tell you what comes to mind when you say the word “lawn” and they’re likely to tell you a story. It won’t be how NewGrass complements small spaces. Probably, it will be something about how they rolled around in their backyard as a kid. Also, it could be about how they laid on their backs in the summer and looked up at the stars. To that end, NewGrass® is the perfect safe solution for anyone looking to continue both traditions. So when being environmentally friendly is as important as having a water-conserving, green lawn all year, choose us. NewGrass complements small spaces and tight areas. Seems like these might not be grassy otherwise. Yet, with NewGrass, it is possible to create a permanent green space! 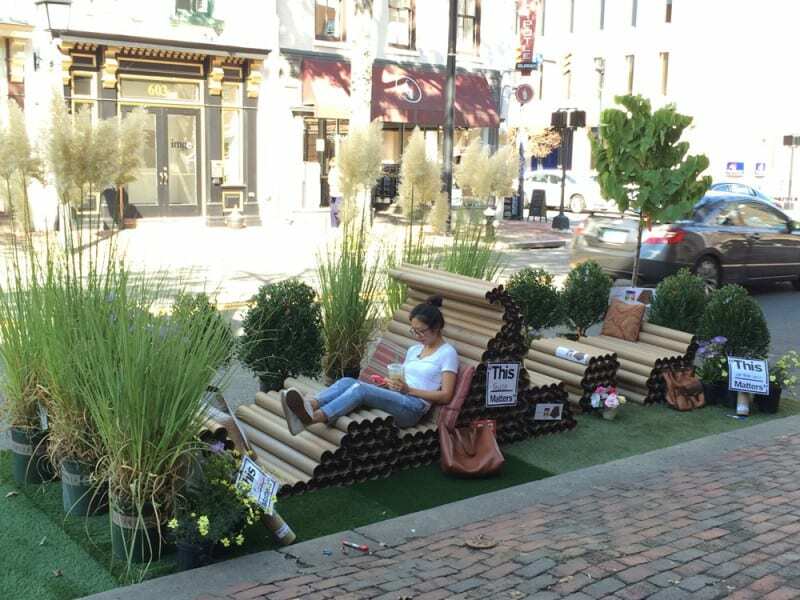 NewGrass®, for example, has been used as part of international PARK(ing) Day. This is annual worldwide event involves artists, designers and neighbors. In short,they transform metered parking spots into temporary public parks. NewGrass® has long been the choice of businesses and homeowners. Why? People want safe, clean grassy areas in even the smallest of spaces. Also, they want it in areas where natural turf is difficult to grow or maintain. So you see NewGrass used in dog runs, narrow side yards, under heavy shade trees and small play areas. And we are not just local either. In addition, NewGrass® complements small spaces nationwide. For instance, NewGrass® provided a grassy micro-park during a get-together in Brooklyn for members of airBNB. The event was hosted at Root [Brooklyn], a huge space near the Williamsburg Bridge. Also, NewGrass® was the ground cover of Park Here, a 0.1-acre temporary indoor pop-up park in the Nolita neighborhood of Manhattan, north of Little Italy and Chinatown. It has also landscaped balcony terraces of the ultra-modern Trump Place. In Atlanta, the producers of the TV show Movie and a Makeover replicated a backyard patio complete with lawn on an Atlanta rooftop using NewGrass®. So call us if you have a small space that needs attention. We have the product to bring it to life! You might be surprised at what synthetic grass can do!